The Arctic could be completely ice-free as early as 2020. The ice cover on the Arctic has come down to 4. mio sq Km as on September 15, 2016 from an average 6.22 mio sq Km in 1981-2010. This appears to have been the lowest extent of the year and is tied with 2007 as the second lowest extent on record. This offers significant implications for global trade, energy security, and geopolitics. Lets understand the energy importance of he region. The Arctic contains vast energy sources 90 Bln barrels of oil, 1,669 trillion cubic feet of natural gas, 44Bln of barrels of natural gas. In total it contains 13% of the world’s undiscovered oil resources and about 30% of undiscovered natural gas resources. The melted navigable waters could also be used for generating thermal energy with the temperature differences on the surface of this water and beneath. The major impact would be on shipping industry. A more accessible blue Arctic could reorient transoceanic energy trade flows, logistical infrastructure such as shipbuilding and ports. Shrinking of ice cover will open up potential sea routes through which navigation will be carried out. First is North West Route. 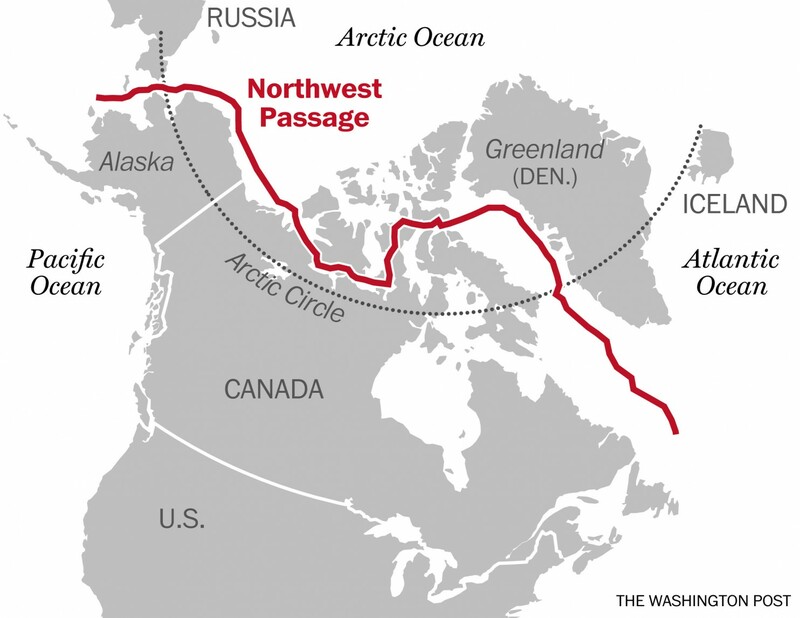 It is a sea route connecting the Atlantic and Pacific Oceans through the Canadian Arctic Archipelago. Previously it was virtually impossible because it was covered by thick, year-round sea ice. But climate change is allowing commercial traffic to pass through this once impossible route.The potential benefits are ship routes from Europe to eastern Asia would be 4,000 kilometres shorter, The vast mineral resources of the Canadian North will be much easier and economical to develop and ship to market, the new route will be 40% shorter than the existing route via Suez Canal. It will cut shipping time by 12 days. Another route is Northern Sea Route. The Northern Sea Route is a shipping route officially defined by Russian legislation as lying east of Novaya Zemlya and specifically running along the Russian Arctic coast from the Kara Sea, along Siberia, to the Bering Strait. The entire route lies in Arctic waters and within Russia's Exclusive Economic Zone (EEZ). While the Northeast Passage includes all the East Arctic seas and connects the Atlantic and Pacific oceans, the Northern Sea Route does not include the Barents Sea. The NSR extends for about 3000 miles. The factual length of the route in each particular case depends on ice conditions. The potential benefits this route offers are that it is alternative to the traditional sea route through the Indian Ocean shrinking the distance between Asia and Europe considerably. The route will connect shipping from Europe to Asia in 35 days, as opposed to the 48-days. The number of commercial ships transiting through NSR grew from 4 in 2010 to 71 in 2013, which speaks of the rising importance of the Arctic. A substantial part of the Arctic hydrocarbon resource is in NW Russia and offshore in the Barents and Kara seas at the western gateway of the NSR. Current and future development of this Russian resource base is the main driver for increased shipping on the NSR in the coming decades. In 2015 a total of 5.4 million tons of goods and project cargo were transported on the NSR, up from about 4.0 million tons in 2014 and 3.9 million tons in 2013. It affects the strategic relevance of existing sea routes navigating through the Indian Ocean. Shipping routes may shift from politically unstable regions like West Asia and piracy-infected routes like the South China Sea, the Malacca Straits and the Gulf of Aden & can bring a shift from the Asia-Pacific to Trans-Atlantic economies,. Hence, countries will rework their strategic calculations. Therefore, this is an important development in global scenario which offers various opportunities mainly in sectors such as shipping and minerals and fishing industry. In shipping sector, the new routes offer alternatives to the Panama and Suez canals which might redesign global logistics. Many big MNCs are already conducting research studies on impact of this alternate routes on business. ex- Norwegian companies are collaborating with their expertise in the Centre for High North Logistics and the newly formed Arctic Maritime Cluster. 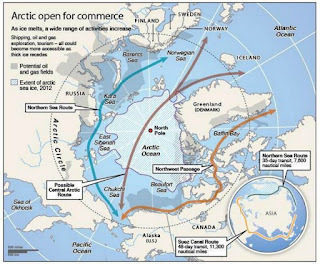 Opening up of the Arctic for commercial cargo offers a faster route for some shipments between Europe and Asia. More goods are shipped from Europe to Asia than the other way around. Therefore alternate routes will tremendously impact shipping industry globally. Now considering Minerals industry, It is important to note that the largest economies in the Arctic belong to Alaska (US) and Russia, mainly because of mining and petroleum activity. Of the international cargo-bearing voyages using NSR, 67% involved shipments oil products. therefore mining industry will be highly impacted due to melting of Arctic. In fact Many Norwegian companies have already collaborated with their expertise in the Centre for High North Logistics and the newly formed Arctic Maritime Cluster to exploit the opportunity. India is also keeping eye arctic trends for the opportunities to capitalize on. Indian companies have acquired 20% stake in the Yamal LNG project. In May 2014, ONGC Videsh and Russia’s Rosneft signed a MoU which paves the way for the companies’ cooperation in subsurface surveys, exploration and appraisal activities and hydrocarbons production in Russia’s offshore Arctic. India is also planning to invest in the Canadian northern Alberta oil sands deposit, the 3rd largest proven crude oil reserve in the world.The ice-breaker will play a vital role in the supply of cargo and equipment to the drilling sites, and protect the drill ships and oil platforms from the risk posed by ice caps. Hence, the icebreaker will also be useful for commercial interests. The melting phenomenon will also affect local fishing industry. Due to continued reduction in ice cover in the Central Arctic Ocean, fishery is likely to be mainly within the 200 miles of the coastal states. The five coastal states are all major fishing nations. They have their own extensive management and regulation regimes for their fisheries. Bilateral arrangements exist for cooperation on management of fish stocks , ex- Norway-Russia bilateral fisheries commission. Therefore, with melting of ice due to climate change arctic area will be more navigable offering huge economic opportunities to the world & would help securing natural resources for future needs. In addition it also bears capacity to change the course of political strategic equation around the world.